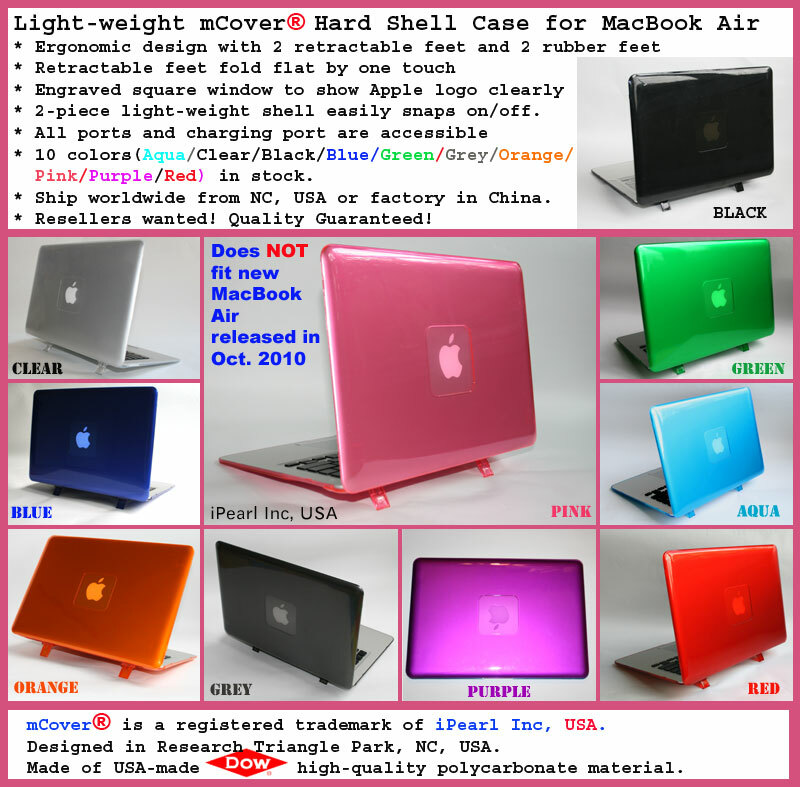 Made of high-quality USA-made polycarbonate material, which is shatter-proof and will protect your MacBook Air all around. The only MacBook Air Hard Case with foldable feet to let you type more comfortably. It also helps your MacBook Air to stay cool. 2-piece light-weight(12.5 oz) shell easily snaps on and off. Engraved square window to show Apple logo clearly and make it more stylish. The MacBook Air's original heat ventilation grill is NOT blocked. Extra ventilation holes near the battery compartment for better heat dissipation during charging. 10 vibrant colors(Aqua/Black/Blue/Clear/Green/Grey/Orange/Pink/Purple/Red) in stock. Does NOT work with newer 11.6" or 13.3" MacBook Air released after Oct. 20, 2010. Please check our website for newer hard shell cases for newer 11.6" A1370 MacBook Air or 13.3" A1369 MacBook Air. USA domesitic Priority S&H(3-4 business days delivery) with delivery confirmation number for only $9.95. USA domestic Expedited S&H(1-2 business days delivery) with tracking number for only $19.95. USA buyers, please order them below. International Airmail(5-10 business days delivery) S&H: $19.95. International buyers may need to add extra S&H if you order them via the following "Buy NOW" buttons. FREE clear half keyboard cover($14.95 value) for MacBook Air included! FREE S&H fee on additional cases for USA/Canada orders! Note: 1) You can request any color combinations via the color/model request box when you place the order. If you do not clarify your color/model request within 3 days of payment, 2 x clear hard cases and 2 x clear keyboard covers for the MacBook Air 13-inch will be shipped. 2) You can even request a case for white/black MacBook 13-inch and a case for aluminum unibody MacBook 13-inch.